A window into the world of Stirling, 65 years ago. The Stirling Observer Christmas Numbers are now the history journals of their times. 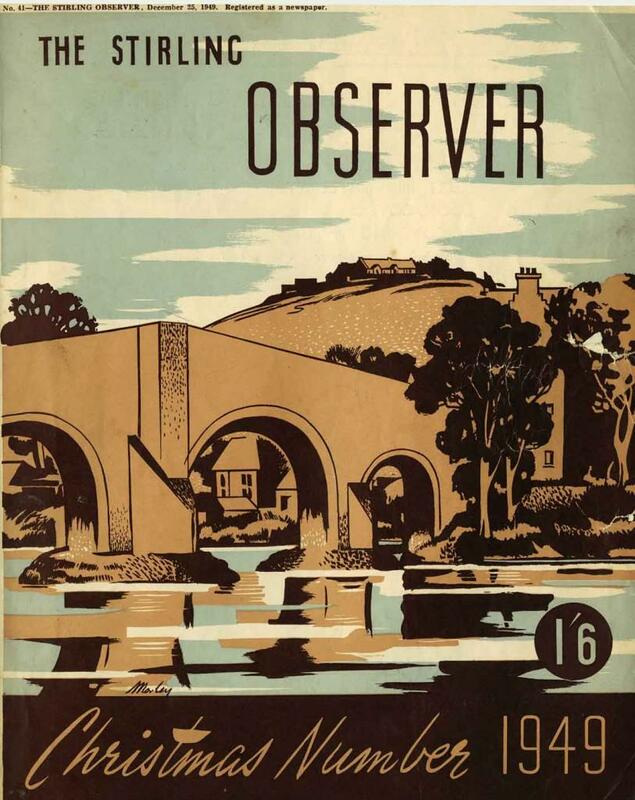 This issue for 25 December 1949 is a recent gift to the Stirling Smith by Finlay Lumsden of Deanston, and is a window into the world of Stirling, 65 years ago. The cover is by Sandford Morley (1910 – 1958), who worked as a graphic designer. Born and raised in Stirling, he became Director of Sommerville and Milne, the first commercial art firm in Glasgow in its time. He created the logo for Alexander’s Bluebird bus fleet. The 120 pages feature the life and loves of Stirling – 124 wedding pictures and adverts from major local stores, such as MacEwen, McAree Brothers, Thomas Menzies, Gavins, and Palmers of Port Street. Provost James Plank, serving his first year of office, re-started the annual Bannockburn celebrations at the Borestone on 24 June. They were suspended during the Second World War, 1939 – 1945. The fire in Drummonds the Seed Merchants, Murray Place, was the biggest disaster of the year. The Golden Lion Hotel lost eight bedrooms when it spread, and there was a fatality. On a happier note, the Plaza Ballroom Staff Dance attracted 250 people and the Stirling on Parade procession raised a record amount for the Old Folks Treat Fund.